For the latest events and special offers visit The Lock Kitchen & Bar website, Facebook or Twitter page. 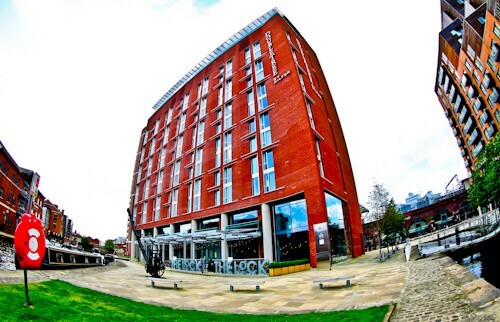 The Lock Kitchen and Bar is located in Granary Wharf, Leeds, less than a 5 minute walk from the south entrance to Leeds Train Station. It is a 10 minute walk to the famous shopping district and shopping malls of Leeds. For those visiting Leeds by train to go shopping, I’d recommend enjoying a meal here first to give you the energy before you go. The Lock Kitchen & Bar is perfect for those of us who are alone, a couple or in groups. If you’re not hungry you can enjoy a beer, wine or maybe a cocktail (check social media for drinks deals). If you need to do some work then you can order a tea or coffee, there is free and fast WiFi, it’s a good spot to have a meeting too. 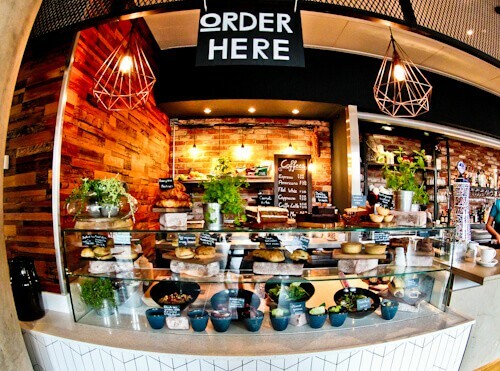 The Lock Kitchen & Bar has its own Deli (above) where you’ll find freshly prepared sandwiches, salads and delicious desserts. You can check the Deli menu out online before going. Affordable prices and freshly made food is what you’ll discover! The question you may be asking is why is the sandwich wrapped up like a parcel? Could it be because of the English obsession of serving food hot? Or could it just be a unique presentation? Whatever the reason, I’ll always remember this sandwich as it was delicious. As well as the Deli, there are some cooked food options such as steak, sea bass, salmon, chicken or pasta. Check out the kitchen menu here. Check out the The Lock Kitchen & Bar website and sign up to have the latest food and drink offers emailed directly to you, alternatively check out the Facebook or Twitter pages. 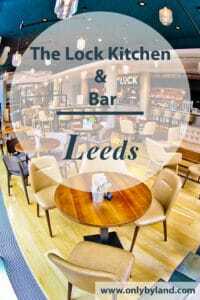 Enjoy your meal at The Lock Kitchen & Bar, Leeds. Am heading out to Leeds in Sept for 2 years, and am glad I stumbled across this. Definitely going to check it out during my first days itself, as I have a feeling that I’ll end up going there may times. Hello Arnav, we are glad you like the look of The Lock! Let us know on Facebook when you coming so we can treat you to something delicious from our menu! 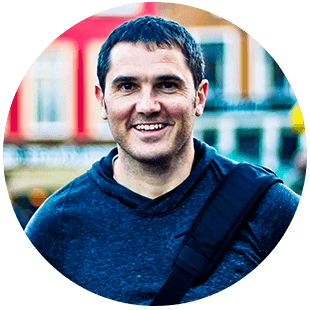 Look forward to hear from you. The Lock Kitchen & Bar in Leeds sounds like a really great place, I definitely have to add this to my list whenever I head up to Leeds. 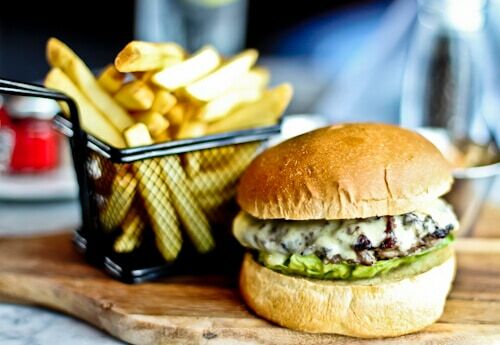 I especially love the look of that Cheeseburger it looks yummy and it made my mouth water. Hello melbtravel, we hope you will put Leeds on your list of places to visit and you will stop be in The Lock for a bite! If I get to visit Leeds someday, I’ll definitely check out The Lock. The views of the canal are wonderful. Hello Whitney, thank you for your nice comment…we agree the canal views are a real treat and so relaxing after a long day in the office! We hope you will visit us soon. The Lock looks like a cozy, inviting space. I love that it overlooks the locks and canals for an interesting view. Funny that the sandwich was wrapped like a parcel–I didn’t know the British were obsessed with hot food. It looks cute, though! Wow the The Lock Kitchen & Bar, looks like such a cozy place. I would love to have lunch there. I think I would go for the burger and fries… it just looks too good. Thank you Paulina for lovely comments…if you are in neighbourhood let us know and come in to try the burger on us! Oh looks delicious! And so easy to get to by public transport. Now all I want is one of their sandwiches. Lock Kitchen & Bar has great interiors. Nice place for celebrating birthdays or anniversary. 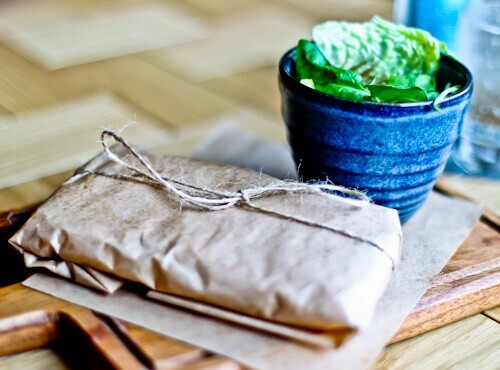 I loved the presentation of sandwich wrapped in brown paper with jute string. Also the exterior of building is photogenic due to red color. Thank yukti, we are happy to hear that you like the new interior! Thank you Yukti, we are glad you like the new interior of The Lock Kitchen & Bar! As you mentioned about the colour of the building, it is really nice to see the shade changing in the light at different times of a day. I would love to eat here! It looks so cozy and inviting, and the food looks delicious! How lovely to wrap the sandwich like a special gift! Hello Lois, thank you for lovely comments…our sandwiches are truly like a special gift handcrafted fresh daily by our team! Hope you will visit us when in Leeds! I am next due to visit the UK around mid next year and Leeds might well be on the itinerary at this stage. 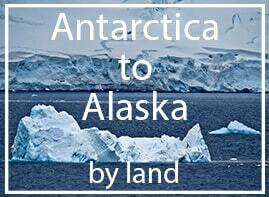 If we do end up there, we now have a recommendation to check out. I thought the wrapping of the sandwich was just amazing! The burger you had didn’t look that bad either. Thanks for the information. Hello Nicole, we would be delighted if you take on James’s recommendation and visit us, for a cocktail or quick lunch, when you are in Leeds next year! This is my kind of place. I love the ambiance and the cozy interiors. And based on the photos you’ve featured, it seems like they have amazing food too! I’ll keep this in mind when in Leeds. Thank you for lovely comments about The Lock Kitchen & Bar interior…we have a great terrace seating overlooking Leeds – Liverpool canal too. It makes a great sun trap or you can snuggle up under blanket until late at night and watch the stars….hope you will visit us soon! Thank you Kevan, its great to hear that our cheeseburger temped you. Besides, that is just a picture you are seeing, imagine the delicious smell when it is inform of you! Would be happy to book you in soon, so you can find out about the wrapped sandwiches mistery ;c) Drop us a line, when you in Leeds. I love your wide angle shots. They are just such good frames! The package of the sandwich is just so cool. The burger just made me hungry. The views just are an add on! would love to check this place out. Thanks for the heads up! Hello Divsi, thank you for great comments. Let us know when you coming and we will be delighted to treat you! We are big Hilton fans so it’s great to see a quality in house restaurant. That grass fed burger looks solid. I could use one right now. 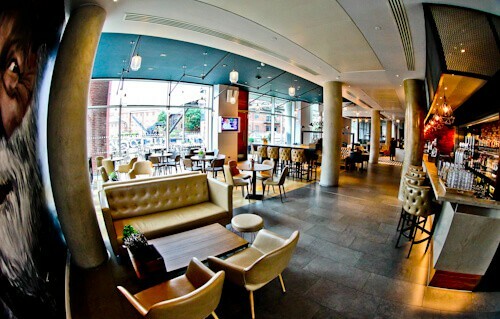 Thank you Jenn and Ed, we love to hear from any Hilton fan…let us know when you in Leeds an try the burger then! Lock Kitchen & Bar looks good and pretty comfortable. The interiors are nice and food looks delicious too. I had been to leeds but not to this place. Maybe in September! I reckon I visited the Lock Bar on a few occasions when I used to live in Leeds. I used to love the burgers there! And as it’s under the hotel it never got too busy that you couldn’t get a seat. You are absolutely right Vicki, we offer a plenty of comfy seating and have a huge terrace overlooking the Leeds-Liverpool canal if the sun is out! We hope to welcome you back soon. I like the ambiance of The Lock Kitchen & Bar. It looks cozy, stylish, and spacious. Actually, I like that the sandwich is wrapped because it will preserve its freshness. It looks like it is handled properly too. The burger and fries have a reasonable portion and look delicious. I would definitely go here if I have a chance. Thank you Iza for lovely comments. Why would you not pop in and try something from our menu, when you near by! We would love to treat you, just let us know! I love the interiors of the place. It is unpretentious, understated and classy. Though you have not mentioned but this looks like a vegan friendly place. Being a vegan I love such places. And I loved the wrapped sandwich. Quite unconventional! We are glad you like it! Indeed, have a nice selection of vegan friendly salads and vegetarian sandwiches…Hope to see you soon! Yum, a grass-fed burger sounds delicious right now! Lock Bar & Kitchen seems to be a good option, especially as it’s good value for money and within quick walking distance of the train station. I like that they have their own deli too; it would be handy for taking a sandwich and exploring Leeds.